This product has been discontinued and is no longer shipping. Manufacturing specs and user information is provided below for owners of the product. The Radial Switchbone ABY is a high performance ABY switcher that is designed to deliver the natural tone and feel of the instrument without introducing noise, distortion or artifact of any kind. The design begins with the same 100% discrete class-A buffering circuit as the critically acclaimed Radial JD7 Injector for exceptional audio performance. Each part is hand inserted into a double sided through-hole PCB for optimal signal transfer. To ensure the natural feel of the instrument is maintained, Drag™ control load correction lets you re-introduce the natural relationship between the guitar pickup and the amp that is invariably lost when the guitar signal is buffered. This also allows longer cable runs of upwards to 15 meters (50′) without noise. 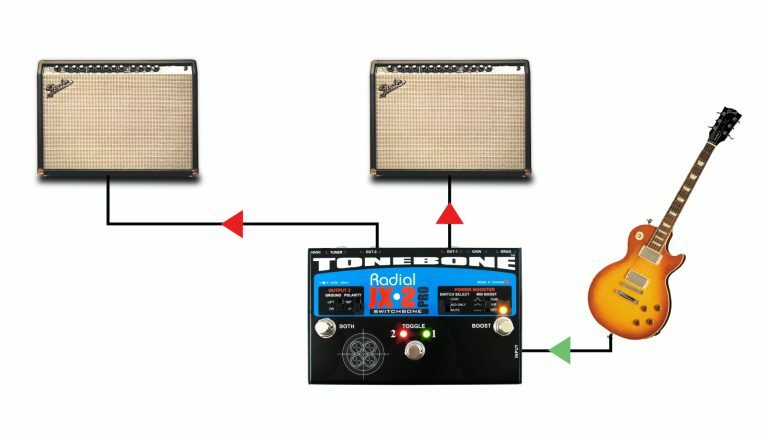 There are three footswitches on the top panel: The first selects between A or B amps while the second is used to combine amps. To get rid of the pops common to passive switchers, the Switchbone employs photocells that ramp-up the signal for smooth noise-free switching – even when used with high gain amps. To eliminate hum and buzz caused by ground loops, the Switchbone’s second output is equipped with a transformer for 100% isolation. 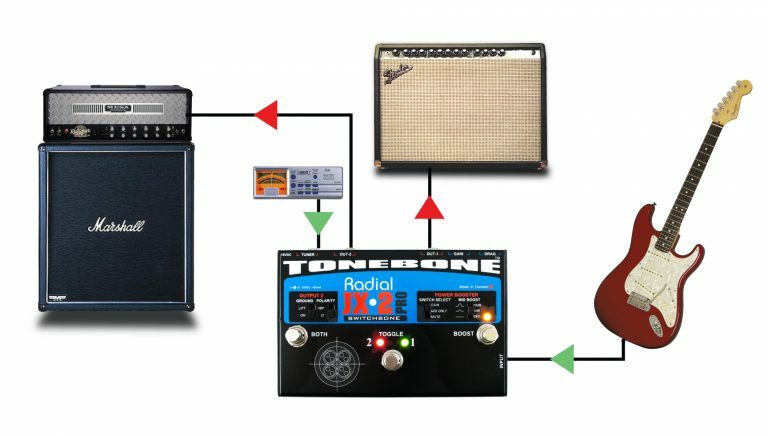 To ensure the two amps play in absolute phase, you simply toggle the easy access 180º polarity reverse switch. The third footswitch lets you engage the built-in power booster. This is equipped with a variable level control and is augmented with a 3-position mid-boost switch for extra cut when soloing. The boost function can be bypassed and converted to a mute switch for quiet on-stage tuning. A separate tuner out is always on for quick tune-ups and buffered to keep your signal path clean. Smart ‘flashing’ LEDs let you know which amp was last selected keeping you in total control at all times. The Switchbone is the most natural sounding ABY amp switcher made today. 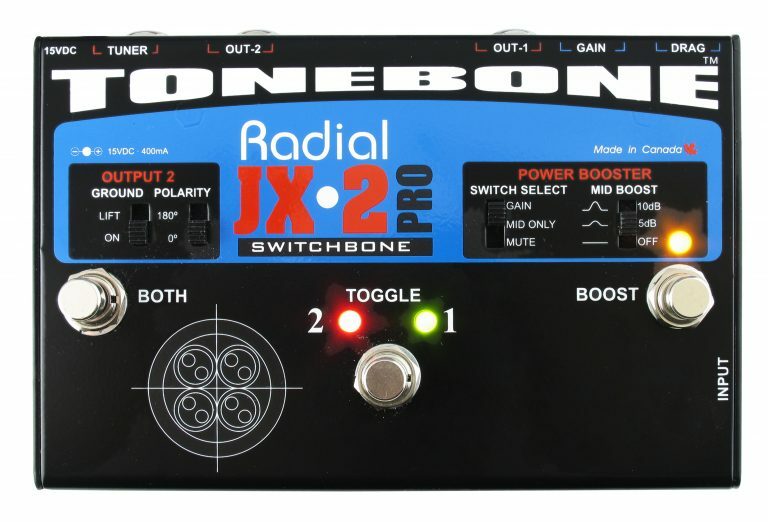 The Switchbone is a high performance ABY designed to deliver the natural tone of your instrument to your amps without introducing noise or artifact. Drive two amps plus your tuner at the same time. Photocell switching, transformer isolation and buffered outputs eliminate popping, ground loops and noise of all types. 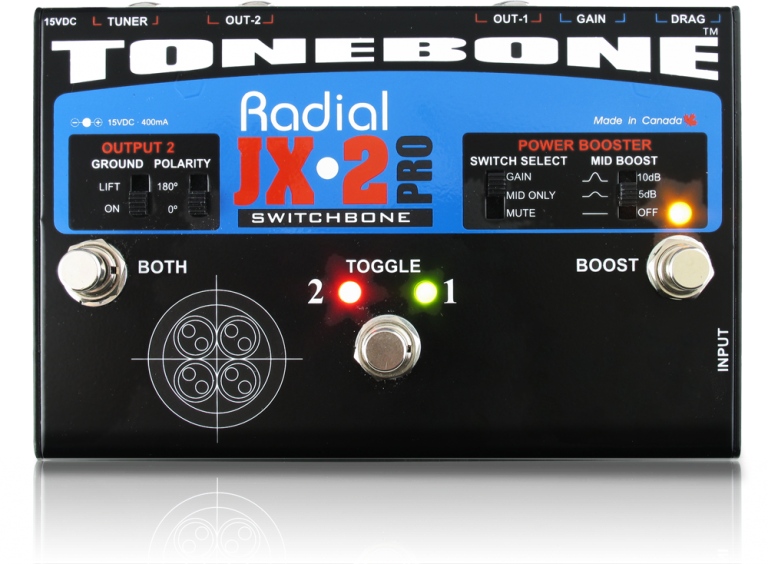 For older amps, the Switchbone can be used to drive the two amp channels so that you can toggle between them. 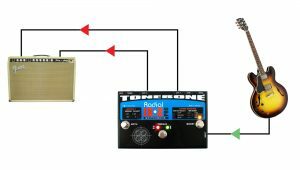 The 180º polarity reverse ensures both channels play in phase.